I had found several AirBnb listings that looked promising. And I was about to send some inquiries out to them when I figured I might as well check out the couchsurfing possibilities on the island. I wasn't expecting much choice simply because the couchsurfing population in popular areas tends to get saturated with requests and so they often get ignored. And, we didn't have a lot of success with our requests in Europe this past March and April, so I wasn't feeling too confident that Barbados would be any better. But, I found one new listing that looked good. The problem is that our trip is still three and a half months away. And although we have done a lot of couchsurfing, we hesitated to use it in Barbados due to the fear of someone cancelling on us and us being stuck in a fairly expensive country with no reservations. That is not a bad thing if you're in a place like Romania because accommodation is inexpensive... but in Barbados it might be a different story. And so we were looking around early to see what options exist. Anyhow, I sent the guy a note, and he got back to me the next day. It's always good to stay with a local right at the beginning of a trip to a new country because they always have lots of great tips. I had only requested for three or four days when we arrive. He said that he totally understood our predicament and said that it would be no problem if we wished to stay at his place for the entire 19 days! Wow! The guy is about our age, and is an expat from England who has lived on the island for about 8 years. And although he's new to the couchsurfing website, he is also listed on hospitality club which is a similar site. So I checked out his profile there, and he has glowing reviews from everyone who has stayed with him. And, he owns an airplane on the island that he uses to visit other islands! His place is right across from the beach and he lives on the top floor. The beach across from his apartment building. It almost sounds too good to be true, but we've had other great couchsurfing experiences in the past, so maybe this is just meant to add to that list. And of course we don't take his generosity for granted. Ruth will be happy to cook for him while we're there, and I'm sure we'll take him out for a few meals. It will make our trip really cheap, since we only paid $128 CAD each for the return airfare! So, hopefully things don't fall apart at the last minute, but he has confirmed that we are good to go, short of him getting hit by a bus, as he said! Our time here at the park is going by really fast this season. 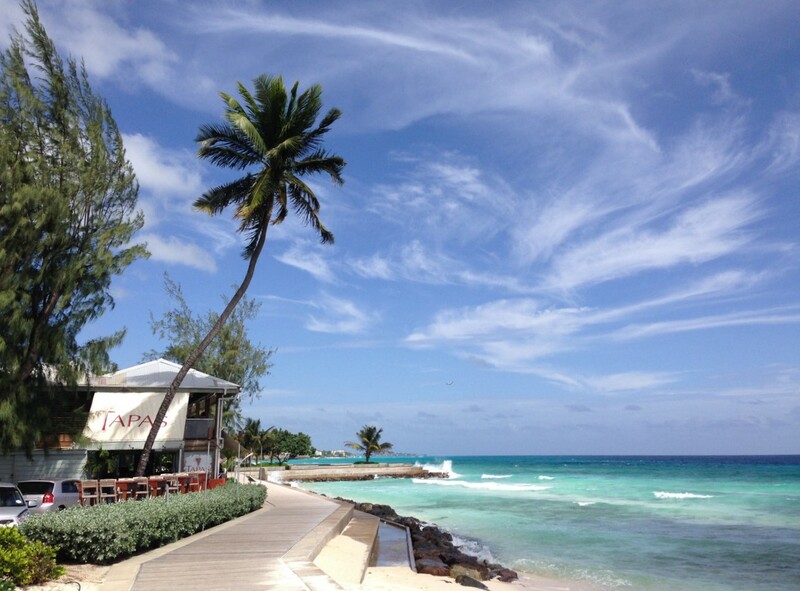 Hopefully our 19 days in Barbados goes by really slowly! Wow, I hope it all goes smoothly for you, very neat! The way the buses drive there that is a distinct possibility! You did well on airfare. I spent almost $4000 for the three of us! Kevin always does well on our airfare prices but remember that our airline voucher paid for the base fare, so all we had to pay was the taxes and fees. Wow that sounds like it's going to work out really well for you guys. It is certainly looking that way, we have our fingers and toes crossed though! The header picture looks like a postcard! With Ruth's cooking, I'm sure the guy will ask you to stay longer or come back. He may even pay you for your stay! Thanks Chris! The park is looking great, hopefully we can keep it that way with the hot dry spell that we have for the next week or more. Lots of sprinklers running none stop around the park.